The FX350 System uses the Power Plus I Pressure Plate with Clutch Masters New Formula Button disc. This clutch is designed for the street enthusiast or weekend racer who plans to abuse their vehicle on an occasional basis and have a spirited driving style. 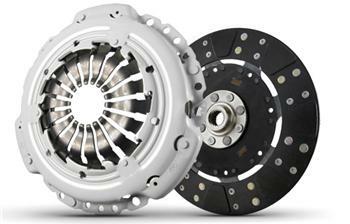 The FX350 clutch system has a higher holding capacity than a segmented Kevlar lining without compromising the street friendly characteristic Clutch Masters is known for. For year’s enthusiast have had to compromise durability for drivability and vise versa, however with Clutch Masters New Formula button we have closed the gap between these two tradeoffs.